Previous instalments in this series: Arsenal/adidas, Barcelona/Kappa, Tottenham Hotspur/Hummel. The first set of Newcastle United kits made by adidas are rightly lauded – for instance, The Football Attic ranked the home as the eighth-greatest shirt of all-time. Therefore, it’s possibly easy to forget those strips’ predecessors, which are certainly worth remembering. 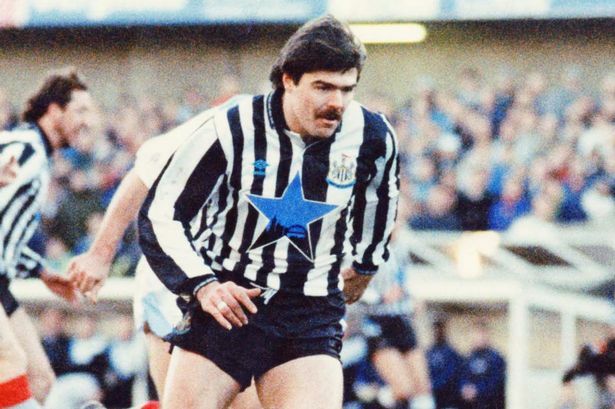 Asics only made the Newcastle kit for two years, 1993-95, but they managed to come up with a great set of outfits. At the time, the Japanese company was in the midst of a big push in English football – between 1989 and 2001, they also made kits for Aston Villa, Blackburn Rovers, Bradford City, Coventry City, Leeds United, Millwall, Norwich City, Portsmouth, Stoke City and Sunderland. While they are no longer active in Britain, they do still provide for Vissel Kobe in their homeland. Their arrival at St James’ Park marked the end of the ‘barcode’ shirt, Umbro’s last for the Magpies, and in fact the new Asics kit premiered in the final game of the successful 1992-93 first division campaign, a 7-1 win over Leicester City, with special jumpers worn for the trophy presentation. Design-wise, the home was pretty much as classy as you could get with black and white stripes, with the black cuffs, trimmed in blue, providing the only adornment while there was a splash of the blue on the collar too. In a piece for Planet Football, this shirt was ranked as one of the best of the 1990s by Daniel Storey, though he is slightly incorrect in referring to the ‘Blue Star’ version as merely a special edition. The famous logo, featuring the Tyne Bridge, represented Newcastle Brown Ale, produced by what was then known as Scottish & Newcastle. With Newcastle Brown predominantly popular in the north-east, this shirt was only worn in home games as a dual sponsorship model was adopted – the name of the more widely-sold McEwan’s Lager appeared for away matches, home televised games and clashes with bigger clubs at St James’, with photos would be more likely to appear in national newspapers. Basically, it was like Major League Baseball teams wearing their team name on home jerseys and city name on away jerseys. Across 1993-94 and 1994-95, Newcastle played 104 competitive games, wearing black and white stripes in 93 – the McEwan’s logo appeared in 59 of those and the Blue Star in 34. There were two versions of the McEwan’s. For the first three games of 1993-94 – at home to Tottenham and away to Coventry and Manchester United – it appeared in yellow, with white socks worn in the latter match (notice though how both sock styles featured Blue Stars!). Such a colour choice made visibility difficult so, for the televised game at home to Everton, the logo was now in white on a black background. Oddly though, after the Blue Star appeared against Blackburn at St James’, the yellow McEwan’s was back for one final game, away to Ipswich. The white socks were worn in this game too, but this was the only instance of the Toon changing against a team with blue socks. Incidentally, for a lot of 93-94, there was a difference in the shirt numbers too – the Blue Star had a squarer style, with the McEwan’s featuring the rounded font as which appeared on Asics’ other kits. A newer set of Blue Star shirts later in the season had the rounder numbers. Apart from the white socks as used at Old Trafford and Portman Road, Newcastle also had white shorts available, and these were seen against Wimbledon in the league in 93-94 and 94-95 (they went there in the Coca-Cola Cup in 1993 too, but because referees in that competition still wore black, Wimbledon played in red and Newcastle could use their home). With a purely striped kit, where there are no intrusive panels, a change of shorts and socks can be enough to provide differentiation with no need for a change of shirt. Though Newcastle did wear an away kit away to Leeds in 1993-94, Leeds didn’t change at St James’ and the following season both league games saw the two clubs in home kits. Given that these were times when teams didn’t change kit for no reason, Newcastle’s Asics away and third kits didn’t see much game-time. The blue away, featuring a brushstroke effect, was worn nine times, and the first of those was the home game against Sheffield Wednesday in 1993-94, when the Owls didn’t have a kit of sufficient differentiation. While the blue on the white home change shorts would have allowed for a cohesive look if worn with the away at Tottenham, for example, this kit wasn’t worn in any other format. In 1994-95, its only outings in the Premiership were at Spurs and Southampton – they wore black and white stripes in their first 16 league games, though the blue was worn at home to Athletic Bilbao in the UEFA Cup in October. European involvement and a longer FA Cup run meant that the McEwan’s/Blue Star ratio was a bit more lopsided in 94-95 – 34 to 18 compared to 25 to 16 in 93-94. The beer company’s logo also of course appeared on the third kit. 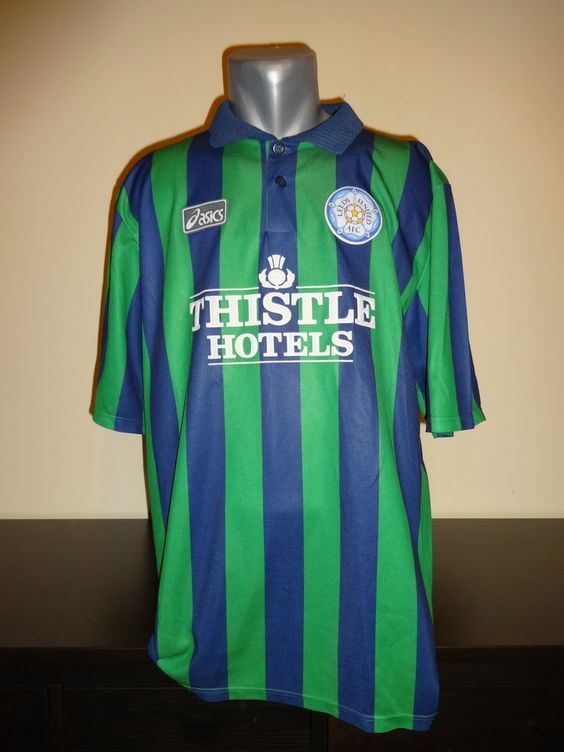 First seen away to Sheffield Wednesday in March 1994 as Newcastle’s two kits clashed, it was not unlike the Leeds third of that time, an all-green affair with dark blue pinstripes. In fact, Hillsborough would be the only place it would appear in a competitive game, as its only other outing was at Wednesday in January 1995. A refreshing contrast to today, when needless third kits receive far more game-time. Definitely prefer the Blue Star version, but will have to be satisfied with owning the McEwans top. Classy kits nonetheless, even if the away came close to the garish style the 90’s are infamous for.